1. 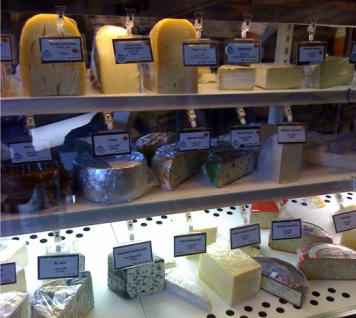 Shop for a good cheese shop – Not all cheese shops are created equal. When you look for a shop, there are a few things to consider. Look for a shop that has a good cheese selection – 50 or more cheeses that cut across a range of styles (fresh, washed rind, bloomy rind, natural rind, blue, etc.) and milk types (cow, goat, sheep, water buffalo). All of the cheeses should be properly labelled, so you know what's what. Ideally, there should be brief descriptions of each cheese. More importantly, however, make sure the shop is clean and that the cheese has been properly cared for. For example, cheese should not be stored or displayed in direct sunlight. 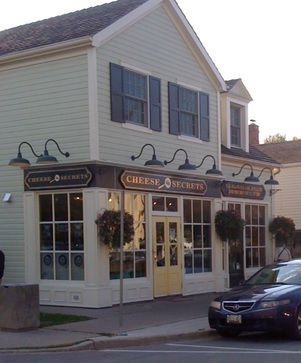 While you don’t want a cheese shop that’s so busy you can’t get personal service, you want to make sure there’s enough retail traffic that cheese isn’t sitting on the shelf too long. And look for a shop that offers more than a pleasing smile and the correct change in the way of service. You want a cheesemonger (a person who sells cheese) who can answer questions, offer guidance, tell you the “story” behind a cheese, and know when a cheese is past its prime. When you find a good cheesemonger, treat them with respect; they are worth their weight in cheese. 2. Ask questions – Don’t be afraid to ask questions of the cheesemonger. If you want to know what accompaniments to serve with your cheese (wine, beer, crackers, bread, olives, fruit, nuts, chutneys, etc. ), ask the monger for recommendations. If you want a cheese that’s made from a particular type of milk (cow, goat, sheep, water buffalo), or that comes from a particular region, or is made by a particular producer, ask the monger for guidance. If you want tips on serving or storing a particular cheese....you guessed it, ask the monger. A good cheesemonger will generally have the answers. And, if they’re not crazy busy, there’s nothing they like to talk about more than cheese. 3. Opt for fresh-cut cheese – If you have a choice between buying the same cheese pre-wrapped or fresh-cut, opt for fresh cut. Here’s why. Cheese is a living, breathing food. It needs some air. That’s why when you buy a piece of fresh-cut cheese, the shop will typically wrap it in butchers paper or a special semi-permeable paper. A cheese that’s sealed in an airtight plastic wrap can’t breathe and will, over time, become a squelchy, sticky, stinky mess. That doesn’t mean you should never buy a piece of shrink-wrapped cheese (in some stores, that’s all that’s available). If you do, however, you need to be confident the cheese hasn’t been wrapped up too long already and you need to eat it sooner rather than later. 4. Try before you buy – If you’re in a cheese shop that does cut-to-order service and you are interested in a particular cheese, don’t be afraid to ask for a sample. After all, if you’re going to spend $10 or $15 for a chunk of cheese, you want to know what you’re getting. A good cheese shop will be only too happy to slice off a sliver for you to sample. That way you can decide if you like it and whether it’s in good shape. Keep in mind, however, that some smaller cheeses are intended to be sold uncut; in these cases, don’t expect the shop to slice off a sample. But if there’s a 20 kilo wheel (or part wheel) of cheese sitting in the cooler, asking for a sample is fair game. One word of advice, though: don’t make a meal of it (in other words, don’t ask to sample every cheese in the shop). Every sample you eat – small as it may be – is money out of the pocket for the store owner. And in the case of small shops, those pockets aren’t very deep to begin with. 5. Check the cheese – Before you fork over your hard-earned dollars, give your cheese of choice the once over to make sure it has no obvious flaws. Some telltale signs of trouble include cracks, interior mould (unless it’s a blue cheese), overt whiffs of ammonia, bloated shrink wrap, significant dents, damaged packaging, unnecessary condensation (inside the shrink-wrapping), a past-due expiry date, and a lop-sided or sunken shape. Remember, it’s not unusual for some natural rind cheeses to have a rustic-looking rind. As cheese authority Steve Jenkins noted in his book the Cheese Primer: “The more rustic the rind and the more natural the colour, the more memorable the cheese is likely to be.” The rind of a washed-rind cheese, on the other hand, should be colourful (typically a bright orange or golden hue), moist and even a bit sticky (due to the Brevibacterium linins that inhabit the rind surface). A bloomy-rind cheese shouldn’t be dried out or excessively runny. All that said, no cheeses are the same and there are exceptions. So, if you have any concerns about potential flaws and you trust your cheesemonger, ask – politely. If you don’t trust your cheesemonger, maybe it’s time to buy your cheese somewhere else. 6. Buy what you need – It’s easy to get carried away in a good cheese shop. The temptation is to come away with a lot more than you actually need. Besides the “ka-ching factor” of buying too much curd, you need to remember that cheese has a shelf-life. Moreover, cheese tends not to do well when it’s bound and gagged in plastic wrap and stuffed in the fridge for an extended period. Fresh cheese should be consumed within three days (five days tops). Most other cheeses should be eaten within the week or as soon as they are ripe, whichever comes first. Of course, the window of opportunity for a hard, aged cheese will be longer if it’s properly wrapped, but even then you have to remember that your refrigerator isn’t the ideal environment for cheese – so the less time it spends there the better. It’s much better to make frequent trips to the cheese shop than to buy too much and end up tossing it in the garbage because it’s past its prime. 7. Think about how you plan to use it – When buying your cheese, keep in mind how you plan to use and serve it. This knowledge, will guide you in your buying decisions – what kinds to buy, how much, what accompaniments. For example, if you plan to offer a cheese course for a dinner party of six, you’ll probably want to serve a “flight” of three to five different cheeses, serving 1 to 1.5 ounces per cheese per person. You may also want to offer a couple of accompaniments (such as crackers, olives, nuts, dried fruit, chutneys) that pair well with your cheeses. And, you may want to think about serving a matching wine, beer or cider. Remember, unlike a nice bottle of wine that can be stored for a few months until the appropriate serving situation arises, cheese is perishable. It needs to be served sooner rather than later. So buy what you need, when you need it, to suit the occasion. That said, there’s nothing wrong with buying a nice piece of cheese to keep on hand to nibble away at whenever the urge comes on. 8. 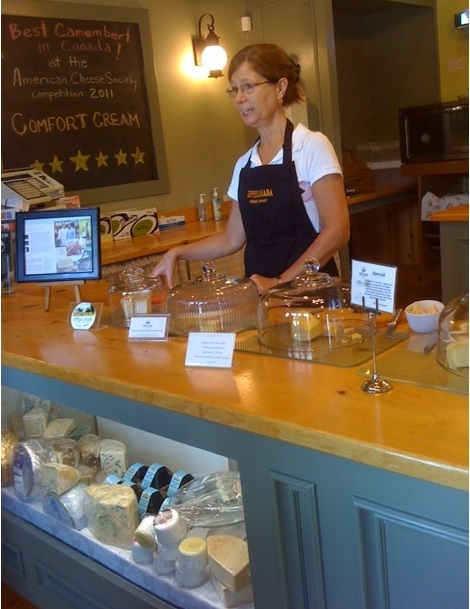 Consider visiting onsite stores – Many artisan cheesemakers have a small onsite store right at the dairy. If you have the time and transportation, visiting these stores can be a grand outing. If you can find a few dairies within close proximity, you can even make a day of it. In some cases, the person behind the counter will be the cheesemaker him/herself – giving you an opportunity to hear firsthand about the cheese you are buying. Even better, many dairies have viewing windows so you can actually see how the cheese is made. Before heading out on your cheese-hunting road trip, however, be sure to call ahead. Not all cheesemakers have onsite stores and those that do aren’t always open. For a list of some of the cheesemakers in your part of the country, visit our Links page. 9. Be adventurous – Don’t get stuck in a cheese rut. When you a find a cheese you like, don’t just buy the same thing over and over again. There are literally hundreds of different Canadian cheeses out there. And while some are better than others, most are worthy of a try. So, challenge you palate. Never had a sheep’s milk cheese? Try one. Never had goat cheddar? Buy some. Never had buffalo mozzarella? Splurge. Pretty sure you don’t like blue cheese? Ask your local cheesemonger to recommend a “gateway” blue (a creamy blue without the edgy attitude). Terrified of washed-rind cheeses because the Limburger your mom served you when you were six smelled like a 16-year-old’s sneaker on a hot summer’s day? Ask your cheesemonger for one that’s easy on the nose (and remember, with washed rind cheeses the bark is often worse than the bite; once you get them past the nose, they can be cute as a puppy). While not every cheese experience will be a success, I can pretty much promise that an adventurous spirit will be amply rewarded. 10. Enjoy the cheese buying experience! – Buying cheese is part of the whole cheese experience. It can be an adventure unto itself – a chance to visit unexplored parts of the city or country, learn from the experience of others, and tantalize the taste buds. Searching for new and different cheese to try can expand your horizons and give you access to a whole new world. 1. Shop for a good cheese shop. 3. Opt for fresh-cut cheese. 4. Try before you buy – if you can. 5. Check the cheese for flaws. 6. Buy only what you need. 7. Consider how you plan to use it. 8. Consider visiting onsite stores. 9. Be adventurous in your choices. 10. Enjoy the buying experience.